Trailing Buy Stops are placed a fixed amount above the current market price. As the market falls, the trigger price adjusts so that it is never more than a specified number of ticks away from the market price. If the market rises, the trigger price does not adjust. 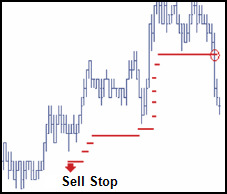 Trailing Sell Stops are placed a fixed amount below the current market price. As the market rises, the trigger price adjusts so that it is never more than a specified number of ticks away from the market price. If the market falls, the trigger price does not adjust. The following screen shots illustrate a Trailing Stop order where the trigger price dynamically adjusts so that it is three ticks away from last traded price. Once triggered, the Synthetic SE submits a child order priced relative to the Ask price minus one. The TTStatus field displays the Trailing Stop in Pending Trigger status. During this time, the Synthetic SE continuously monitors the order and dynamically re-prices the trigger. The quantity displays in the Undisclosed Quantity (Und Qty) column because it is not actually included in the exposed depth of the market. If you are submitting a Trailing Stop order locally (i.e., X_TRADER is managing the order), you need X_TRADER to remain open to continue working. Locally managed Trailing Stop orders are removed from the market if you shutdown. If you are logged into an Synthetic SE, your trailing orders will continue working on the Synthetic SE after you shutdown. Once triggered, the Synthetic SE submits a child order priced relative to the Ask price minus one. Select Trailing Stop from the Modifiers list. Notice that Price Mode is set to Relative and the Fixed choice is disabled. Trailing orders are dynamic and cannot have a Fixed price. Set the base price used to calculate the relative price in the Price Type field. Set the number of ticks that you would like added to or subtracted from the trigger price in the Offset field. For example, a buy order with a positive offset of one (1) is the Price Type minus one tick. Configure Trailing Stop order parameters. Enable Trailing Stop and the number of ticks from the last traded price in the Enable Order Types section on the MD Properties | MD Trading tab. From MD Trader, select the Trailing Stop order configuration. Select the Trailing Stop configuration in the Order Type drop-down list. This displays an undisclosed order in the Working Orders column adjacent to the price..